Bandai Namco Entertainment previously announced the Road to Boruto DLC would be coming to Naruto Shippuden: Ultimate Ninja Storm 4 on February 3rd. The Road to Boruto DLC will be available to download digitally for $19.99 on the PlayStation 4, Xbox One and PC. 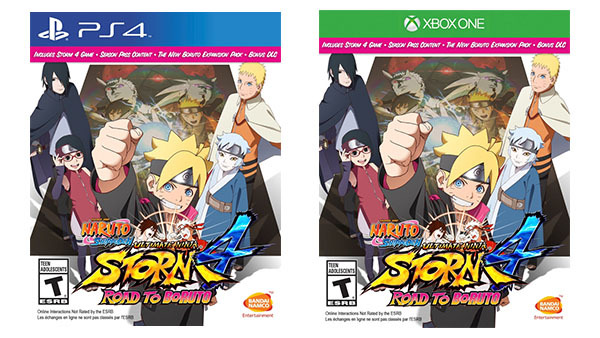 For those who already own Ultimate Ninja Storm 4, Bandai Namco will also be offering a physical edition of the game which includes Ultimate Ninja Storm 4, all of the season pass content and Road to Boruto for $49.99 in both North America and Europe for both the PlayStation 4 and Xbox One. Road to Boruto is a brand new story that takes place years after the events of the conclusion of the Naruto Shippuden anime/manga series and introduces Uzumaki Boruto the son of Naruto Uzumaki and the new generation of Shinobi. Road to Boruto will also include new playable characters for both offline and online Free Battle Mode and new fighting styles for Naruto Uzumaki and Sasuke Uchiha in their Hokage Naruto and Adult Sasuke costumes.